The word “community” evokes certain feelings, associations and desires, but as I sit down to write briefly about the new Community Yoga class at UVY, I find myself hesitating. I want to do justice to this vast word. It’s a big, big word. Like “Yoga”. Or “Love.” My own sense of the word is that it represents a group of people who come together, mostly intentionally, to be part of something bigger than the individual. Community is inside of you – but it’s not about you. It’s about other’s experiences with you. 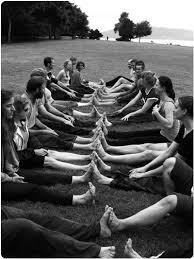 In any given yoga class, we have a community of 5, or 25, however many people show up. The wider yoga community: all of you who read these weekly-ish emails, come to class, park in White River, meet for tea at Tuckerbox, introduce yourself to the person next to you in class….that’s all community for sure. Community is a construct of support we create intentionally or not, or join, or seek out, in order to feel less alone. Community is inclusive. Community can be people across the globe supporting each other—the illness of a dear friend, or the parents of children with learning disorders. It is a big broad word, and it is also a small, local word. Community is our neighbors. Community is our local school, our local selectboard. Community is enriched by the smiles and “hellos” people share as they come into yoga class, quietly or rushed, calm or stressed, as they unroll their mats. As they sit together, sweat together, and find stillness together. Community is strengthened when a group of teachers in training generously agree to share their growing skills on a monthly basis by teaching a free yoga class. Community is whomever shows up. Community is us. It is connection. It is already inside you, just waiting to be shared with another. At Upper Valley Yoga, “Community Yoga” is an invitation to everyone to experience yoga, free of charge. And, hopefully, a community experience we can offer on a monthly basis from now on. I hope you will join us this Friday!